Many thanks to Chris Heuer and Kristie Wells for organizing fantastic Social Media Workshop. Chris Heuer started off with a talk called "Conversations Aren't Marketing"
What is Social Media? "Being social with media." You can describe as the "tools" or you can describe it as media. The latter is a problem because it does not describe well for newcomers. It also can't be perfect. Because of the broadcast era, the relationship between a business and a customer became less personal. The social media tools allow us to scale personality and better relationships. Social media makes things visible. You can fail fast and fail cheap! Important element of social media impact - what are the effects? Gave an example of a blogger outreach program where they gave bloggers a product - solar powered batter recharger. One of the bloggers got on CNN to talk about the product. How likely are you to promote this to your friends? Use it - and ask them why. The way the entire market functions has changed drastically, we reached the digital tipping point. If you're going to listen, you need to respond, and then make change. Example ComcastCares on Twitter. Empower the "Frank" in your company. Marketing consists of human beings, not market segments. I don't want to work with anyone I don't personally llike or respect. Social media isn't an object - it is what you do with it. Professionally produced content may be seen as less valuable because it isn't seen as authentic! Another twist on the topic. You listen and participate, but the most important thing is educate your users, partners, venders, anyone in business with you. If there is a new service, shiney object, you don't have to use everyone - you can create an account with your organization's brand. ping.fm - service is another that will cross-post. Set up you preferences so if someone replies to you, you get a notice. Even if you are not using. If you want to own the marketplace, you have the ability and it's almost free. Time is the new money. It is your time - learn how it works and make the media. You can earn the market place. 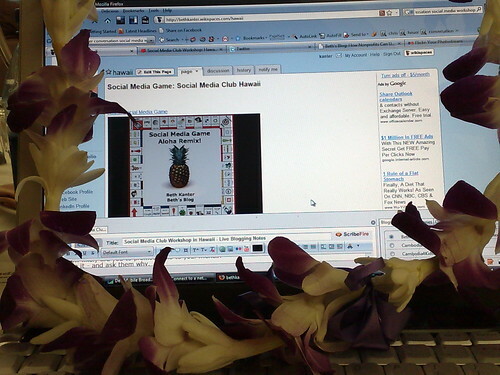 Gave examples of how people could use social media to leverage Hawaiin tourism. We are talking about a lot of new apps, new terms and how can early adopters be your tour guides. This group can help. Start out with something really simple - like once a month. Be consistency is more important than the exact number of times you publish. 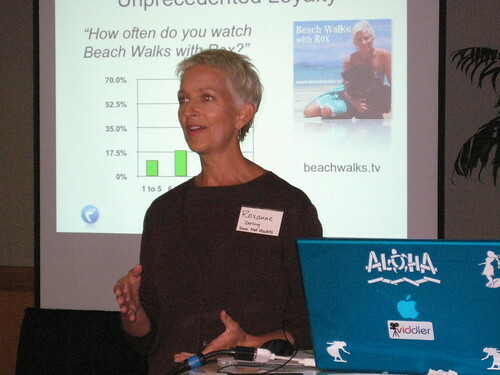 Shows a comparison between gohawaii.com and beachwalks.tv - is higher on engagement. With podcasting you can also have subscribers, cmments, cross-postings, episode ratings, community chats, and mashups and more. Has set up a Ning. Was concerned whether she could support it - but what has happened is that people are talking to one another. Measured this with a survey - after watching beachwalks - desire more or less to visit. Comments "before I saw the show, didn't want to come." She started her show with the worst tourism conditions possible. Don't be afraid of the real deal. I got to meet Lorelle from WordPress! We did a modified World Cafe and during the full group sharing, we told us about a cool tool for listening called Social Media Firehouse.